It would be a mistake to consider the work of Vernon Ah Kee as purely political in motivation. The 50 year old artist, whose work is the subject of a major survey exhibition at the National Art School Gallery as a part of Sydney festival, expresses his approach in a forthright and uncomplicated manner: this is not history, he says, this is my life. Ah Kee is part of a group of Indigenous artists who have made the struggle of Aboriginal Australia – and the attitudes, beliefs and ideologies of the non-Indigenous people that occupy their country – the explicit core of their work, underscored by personal history and perspective. Ah Kee’s work ranges through painting and drawing, text works, video and sculpture. Described as a conceptual artist, he uses each of these mediums to approach his subject with varying degrees of subtlety. At the louder end of things, text works such as Rush to Judgement and Waltzing Matilda (both 2016) build a dense typographic field comprised of words and phrases associated with specific events in recent Australian history – the first recalling the death and rioting on Palm Island in 2004, the second the 2005 Cronulla riots – creating an unflattering portrait of contemporary Australian attitudes and received wisdom. One section of Waltzing Matilda declares PURE BRED AUSSIE, a well-known declaration on the T-shirts and thongs of proud non-Indigenous “patriots”, but an insult to the country’s first people. The artist’s large charcoal drawings are no less powerful, but reserve their message for a quiet contemplation rather than declarative force. Portraits including Annie Ah Sam (2006), Annie Ah Sam B (2008) and Profile II (2006) recall the projects of 20th century anthropologists who documented the faces of Aboriginal people across Australia, here given the context of the artist’s own family, personalising a project of profound depersonalisation. Indeed, the title of the exhibition Not An Animal or a Plant – which is also rendered as a text wall work – refers to the fact that at the time of Ah Kee’s birth in 1967 he was not officially considered a member of Australia’s population but rather a part of its flora and fauna. 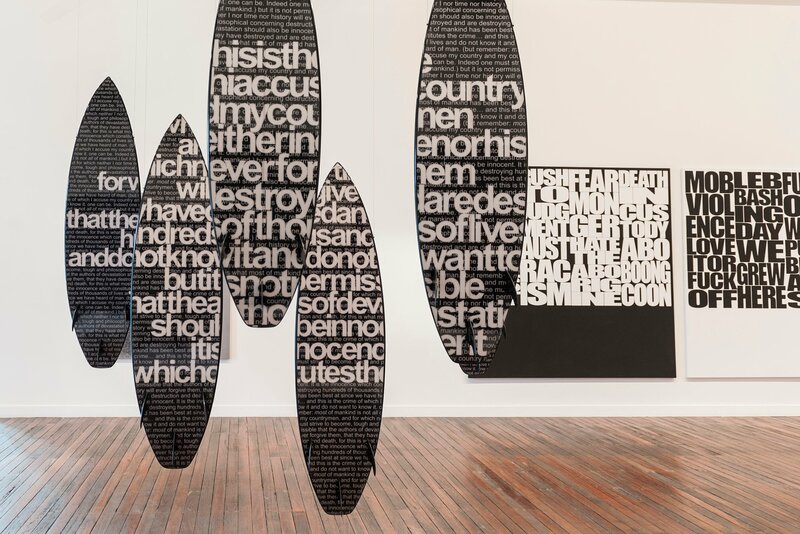 One of Ah Kee’s more provocative works is Authors of Devastation (2016), an installation of the artist’s custom painted surfboards that feature rainforest shield designs on one side, and on the other, fragments of text from the US civil rights campaign. The play between the iconic shapes of both Aussie beach life and Indigenous warriors make for a provocative mix, one that is both enticing for the boards’ design and colour, but also for the clash of cultures. One of the works on the show that I found problematic was a series of found objects exhibited under the title Born in This Skin (2008). When Ah Kee took part in the 2008 Biennale of Sydney, he claimed a series of graffiti-covered toilet doors in a disused Cockatoo Island building as a work of art. The doors were scrawled with hateful racist and misogynist text. By claiming these real-world objects as symbolic representations of the hidden discourse of racism, it’s as if Ah Kee is saying, “This is the real face of race relations in the country”. While one can appreciate the sentiment, it doesn’t seem that effective either aesthetically as a work of art, or politically. This work is ugly and blatant, and hard to reconcile with the refined delivery of Ah Kee’s oeuvre. The issue for me is that, by using the graffiti of some unseen dock worker as a representative example of race hatred at its worst, the viewer in the gallery – and by extension the art world itself – has a handy a scapegoat. Looking at the work in the gallery I was reminded of some commentary that has appeared in various reader comments posted online, including on this site, which argues that artists such as Ah Kee and his contemporaries – such as Richard Bell and Tony Albert (also members of the ProppaNOW collective), and indeed any Indigenous artist whose work engages directly with the politics of black Australia – are somehow being given special treatment because the artists are Aboriginal and the work is “political”. The argument is that the contemporary art world is too afraid to be seen as politically incorrect if it holds the work to the same aesthetic and political critical standards that are apparently applied to non-Indigenous artists. In other words, Ah Kee only gets a show because he’s Aboriginal. Looking at those toilet doors as an appropriated artwork, I wondered – despite the intention of their inclusion – whether they didn’t actually divert attention from this other type of racism: the racism of the art world itself? The claim that Ah Kee’s work is second-rate, and only justified by the politics of political correctness, is one which disenfranchises Indigenous artists who use contemporary art to offer a critique of Australian society. That is not to say that individual works of contemporary Indigenous art are beyond criticism, but rather, to disqualify an artist on the basis of their race and the subject of their work should be named for what it is: racism. Ah Kee’s work fights against that attitude, and restates with conviction the urgency of bringing his subjects to light. That the pain and ugliness of racism, as it was historically and as it is now, sometimes comes to the surface in jarring ways is testament to the power of the work. As the artist explained at the exhibition launch, this is not political, it’s personal.